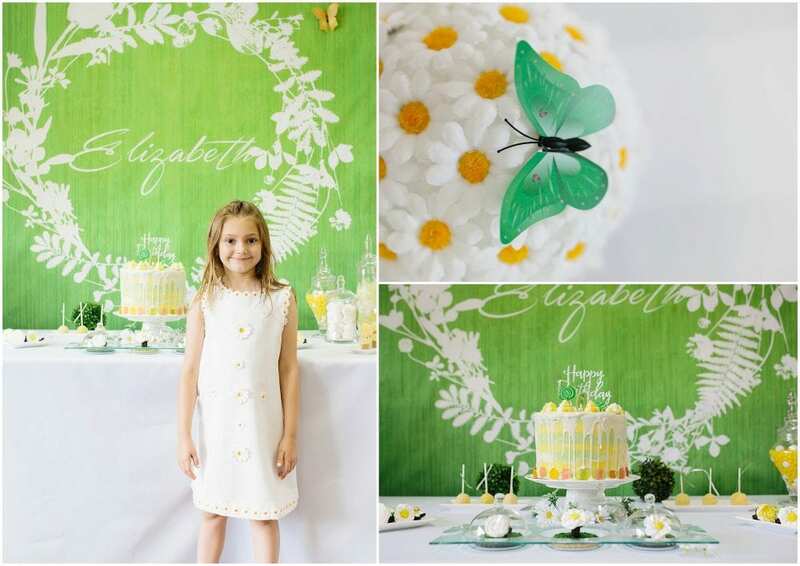 We’re so excited to share with you this adorable White Daisy Birthday Party! Silviya pulled together this amazing birthday party for her daughter, Elizabeth, with awesome DIY decor and specialty made cookies! From the personal touches all the way to the photographs of this party, it’s one you don’t want to miss! Read on to learn more about how Silviya pulled this all together! “I have two girls that I absolutely adore, Anastasia, my youngest, and Elizabeth, my oldest. Well, recently, Ms. Elizabeth turned the big six! Both she and I were getting pretty excited for her upcoming birthday party! I did want to keep it simple, it was a six year-old’s birthday party, after all. I set up a long table in the middle of the room, with a dessert table at the end filled with all kinds of goodies like gumballs, giant marshmallows, vanilla cake pops covered in yellow chocolate, vanilla mousse cups, and of course cookies – but not just any cookies…but cookie rings! I kept just a little bit of Elizabeth’s original theme. The daisy/ flower cookie rings sat upon “moss cookies. These were the hit of the party. Behind the dessert table was a personalized backdrop. The tablescape was lovely, with a white table cloth, white chair covers, adorable green doilies, colorful yellow paper plates, napkins, and either a daisy or a butterfly. For the centerpiece, I took a large styrofoam ball and decorated it with daisies, and it sat in the middle of the table! On the other side of the room, there was other snacks including fruit, vegetables, juice, a daisy shaped quiche, and of course, even daisy picks for the cheese! The cake was a blast to make. I made dark chocolate cake with Italian Meringue Buttercream topped with dripping white chocolate, white and yellow meringues, Italian macaron and of course her favorite gummy bears were lined around the base of the cake.